Very enjoyable time. I would recommend this place. Not cheap But GOOD! 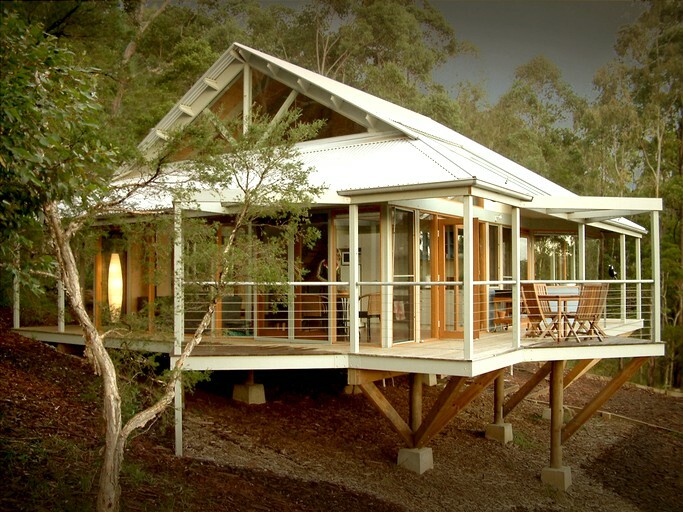 Perched among the trees, with a modern and luxury interior, and large bay windows creating a bright open space, these cottage camping rentals is a romantic paradise near Newcastle, New South Wales. 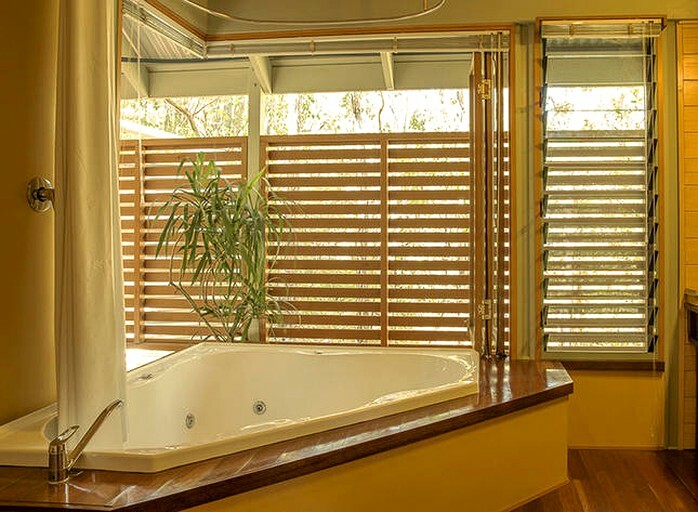 The cottage has a large and private master bedroom, a queen bed and a luxurious bathroom with handcrafted timber finishes and a huge rainwater spa bath. The loft bedroom has an open plan double and single bed configuration. 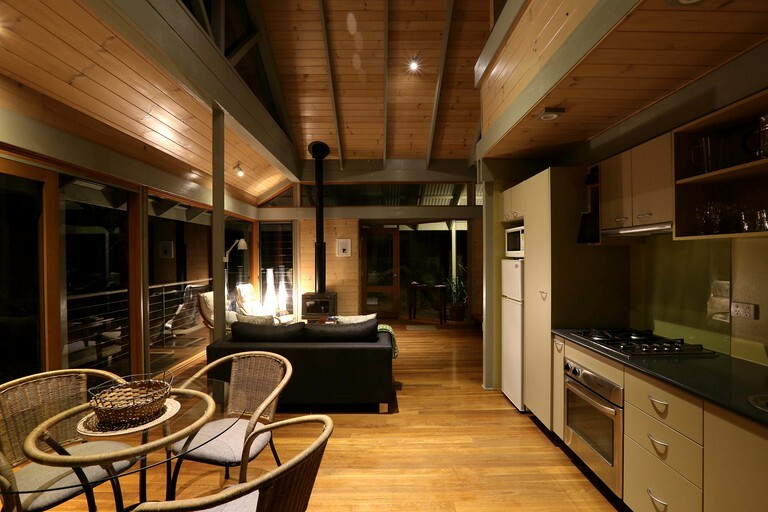 The forest vista is an added bonus, which adds the illusion of 'being away from it all'. 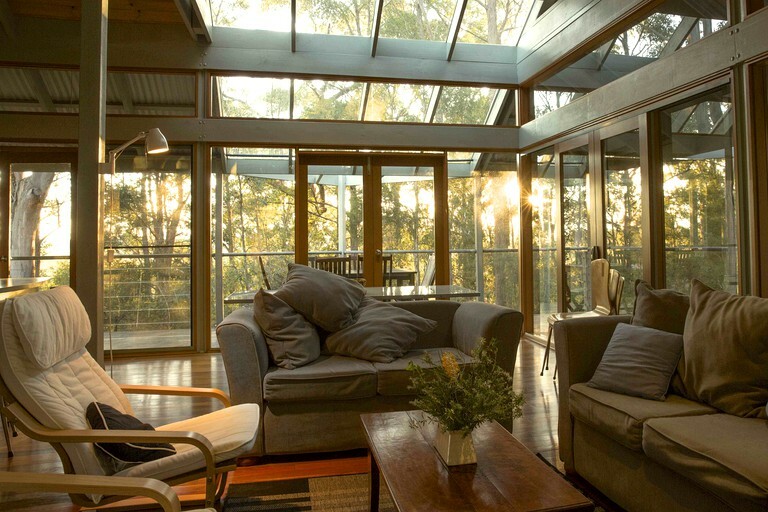 Reconnect with nature in this timber and glass cottage designed for comfort & spaced for privacy. Nestled thoughtfully amongst the trees the large and private master-bedroom with queen bed and waffle bathrobes for guests. Adjacent is the luxurious bathroom with hand-crafted timber finishes and huge rainwater spa bath designed to for relaxation. The generous open-plan living area with lounge/dining and wood fire, plus a well-equipped kitchen with oven, gas cook top, fridge, freezer and everything guests need to turn their favorite produce into a gourmet meal. Open the expansive windows onto the wrap-around verandas where guests can enjoy an evening BBQ or just laze in the hammock at sunset. The loft bedroom with its open plan double and single bed configuration. 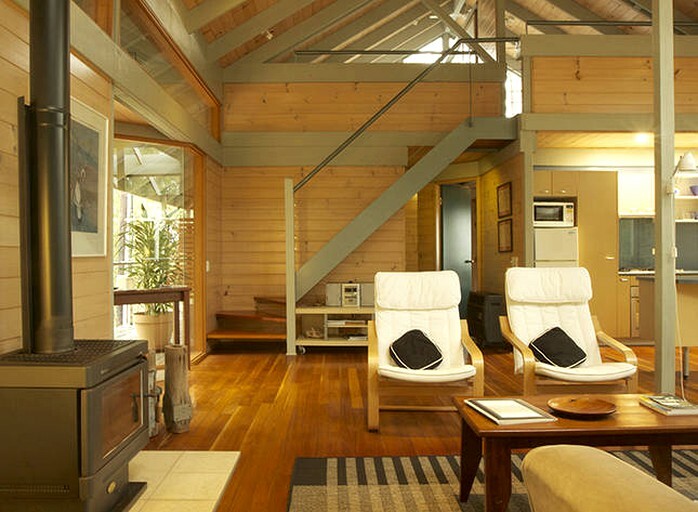 The cottage has all the modern conveniences to ensure a comfortable and luxury glamping getaway. The property is equipped with a barbecue, a well-equipped kitchen and a rainwater spa bath. The communal area has a swimming pool, a group lounge/ dining area, and a small conference and games room. There is also a large group kitchen with a coffee machine. Luxury waffle weave bathrobes are provided. The host offers guests the opportunity to pre-order a generous breakfast basket for $13 USD (or $17 AUD) per person. 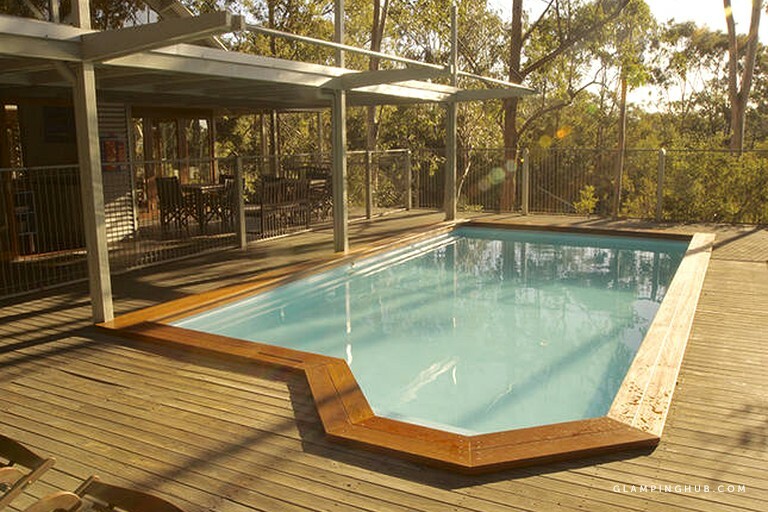 Situated in the forests of New South Wales, this luxury cottage is a mere 2.5 hours away from Sydney. The area is home to Myall Lakes National Park, the towns of Sea Rocks, Hawks Nest and Bulahdela. The National Park is a nature watcher's paradise, as it home to a flourishing wildlife such as sea eagles, pelicans, wallabies, kangaroos, and goannas. It is also home to the oldest sand dune system formed during an Ice Age, which numerous aboriginal sites hidden in the dunes. Close to the beaches and coastal lakes, especially Smith Lakes Coastal lake which is known as the largest in Australia. Glampers can explore the commanding sand dunes, which are scattered with Aboriginal tools; kayak and swim in the tea tree lakes; or snorkel and surf in the crystal beaches. Between May and October, a swathe of whales pass by Port Stephens, which makes it a popular destination to go whale watching as they can be seen from the beach and dunes. Guests can also go one dolphin watching, as these marvelous animals can be seen all year round from the local beaches. There are also a wide variety of walking trails which range in ability and lead to the National Park for the keen bush walker. There are also many mountain bike tracks and roads for those who wish to get away from the major tourist spots. Those who wish to try the local delicacies can try some fresh oysters, Myall prawns, lobster black fish, sea mullet, and much more. Children must be supervised at all times on the property. Extra persons, including children, should be arranged prior to arrival. There is a 10-kilometer speed limit on the property to ensure the safety of children and wildlife sharing the roads/walkways.